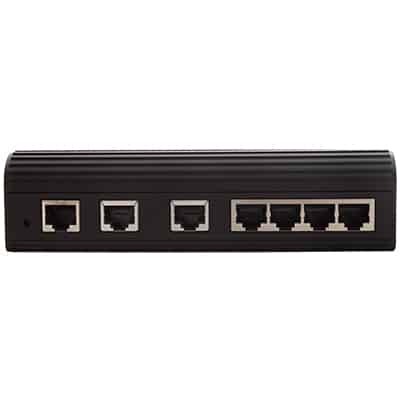 Managed Power over Ethernet Industrial managed switch, four PoE high power ports and two Fast Ethernet ports, IEEE 802.3af and high power 30W cable. 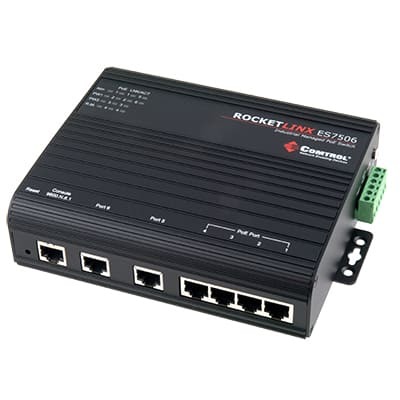 Comtrol’s RocketLinx ES7506 product is designed for industrial PoE applications such as IP surveillance or wireless access points, where the power source is not conveniently located. 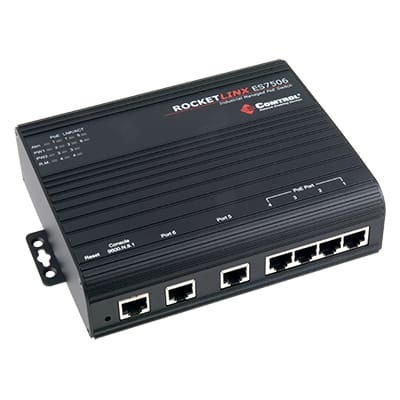 The RocketLinx ES7506 supports intelligent PoE control and schedule management. Each of the four PoE ports can be configured in a weekly schedule by hourly basis and PoE on/off can be remotely controlled via SNMP and Web. It is compliant to both IEEE 802.3af PoE as well as the pioneer standard of IEEE 802.3at PoE Plus designed for boosting PoE delivery up to 30W in each of the four PoE ports. The RocketLinx ES7506 can auto-detect 24V and 48V power input and can deliver 24V and 48V PoE outputs which allow more applications where 48VDC is not an option. The two uplink ports can be configured as Redundant Ring ports recovering network failure in less than 5ms, or RSTP ports integrating with other standard switches. Full network management features such as SNMP v3, QoS, IGMP v3 are all supported. If the powered device fails to respond after a pre-configured time interval, the ES7506 will reboot the powered device and continue to monitor the powered device in every pre-configured time interval. Also, unmanageable powered devices can be managed through the RocketLinx ES7506. The IP31 rigid aluminum flat casing and wide operation temperature range ensure reliable operation in places such as mass transit vehicles or outdoor usage. Dimensions 6.4" x 1.75" x 5.35"
PD classification detection, class ID 0~3 follow IEEE 802.3af standard, and 30W High power deliver procedures for class ID 4. Package Dimensions 10.1" x 7.0" x 3.6"
RocketLinx® ES7506 Quick Install Guide Quick guide to installation and configuration information.